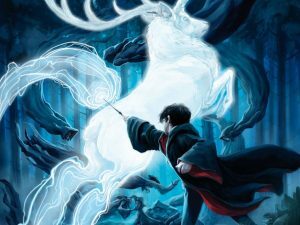 On Thursday 1st February 2018 a group of 50 lucky winners will take part in a Harry Potter Lunch at Rainford High School. The wizardry celebrations started three years ago when then the school decided to take part in the Harry Potter Competition as a part of a nationwide event organised by Bloomsbury Publishing Company. Students were encouraged to write magical spells and create wizarding characters that would be worthy of fitting into any Harry Potter novel. This year, our competition asks students to demonstrate ingenuity and creativity by designing their own fantastical beast inspired by the story, Fantastic Beasts and Where to Find Them. Fifty lucky Year 7 students will be chosen and invited in true Harry Potter style to a huge feast, where dressed as wizarding students, they will feel that they have walked right into Hogwarts dining hall, immersed in film images and music. They will be sorted into the four houses of Gryffindor, Hufflepuff, Slytherin and Ravenclaw before they are seated and then the feast will begin! The Principal, Mr Young, will join the students and hand out certificates, prizes to all winners. Photographs from the event will be sent to Bloomsbury Publishing. Taking part in the competition, Rainford High School hopes to enthuse students to pick up a book, be adventurous, try new authors and read for pleasure. We want our students to enter magical worlds, face quests and encounter immense dangers in their imaginations and in doing so, become great readers. The competition promises to give students an event that they will always remember.